All flowers are different, but some types of flowers are even more unusual than most. Night-blooming flowers save their beauty for the moonlight. Many species of night-blooming flowers release heavy fragrances that make your garden seem enchanted when the stars come out. Consider adding a new, special touch to your garden with night-blooming flowers. Angel's trumpet, Datura inoxia, blooms during mid- to late-summer nights. The large white flowers grow to 6 inches in diameter. The plant grows 3 to 4 feet high, and the stems are covered with blue-green leaves. When the flowers bloom at night, they release their fragrance into the air. 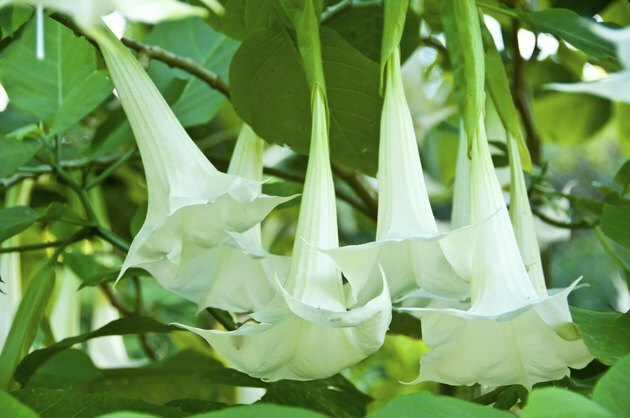 Angel's trumpet shrubs resemble trees, and without regular pruning, they will grow as tall as 20 feet. Angel's trumpet is a native of South America. 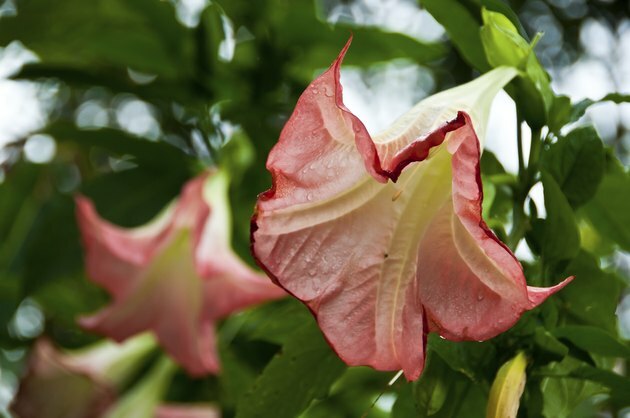 The name is derived from the shape of the flowers, which are trumpet-shaped. The flowers grow in shades of white, yellow and orange. Because angel's trumpet is a member of the nightshade family, every part of the plant is poisonous and should never be consumed. 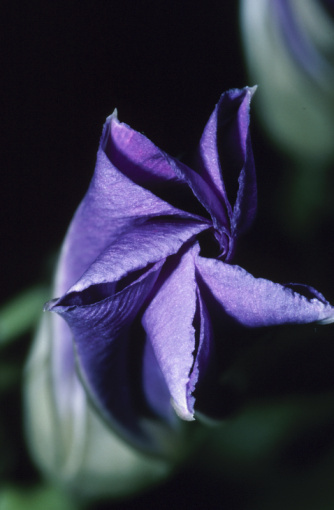 Small children and pets should be kept away from angel's trumpet. The plant should be grown in full sunlight and well-fertilized soil. Keep the soil around angel's trumpet moist. 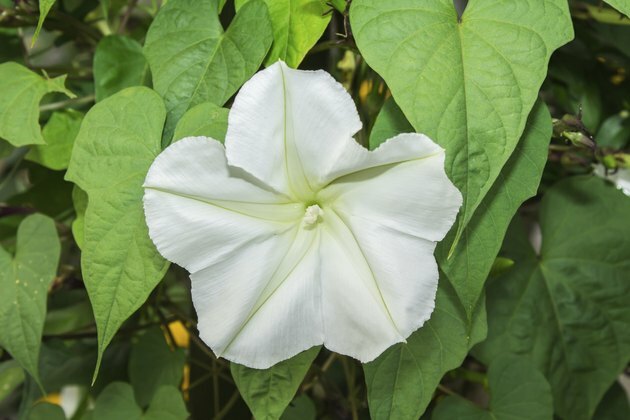 Moonflower, Ipomoea alba, is part of the morning glory family. The flowers release heavy fragrance during sunset, when the 5- to 6-inch blooms start to emerge. Heart-shaped leaves grow on the vines. Moonflowers are climbing plants. Pollinating moths are attracted to the white blossoms. The flowers will bloom more quickly on hot nights, sometimes taking only minutes to completely open. 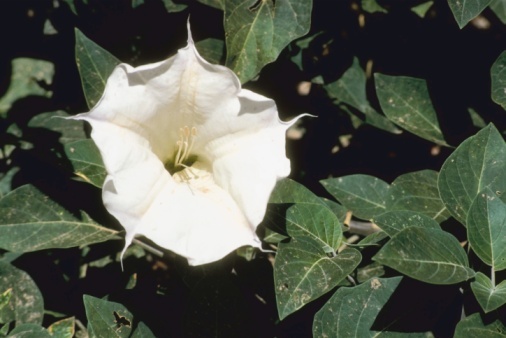 Moonflowers resemble morning glories, which open during the day. Night phlox, Zaluzianskya capensis, is also known as midnight candy. The flowers remain closed during the day, opening during the evening. The blossoms grow in shades of pink and white. Night phlox flowers have a distinct perfume that smells of vanilla, almonds and honey, which led to the "midnight candy" name. 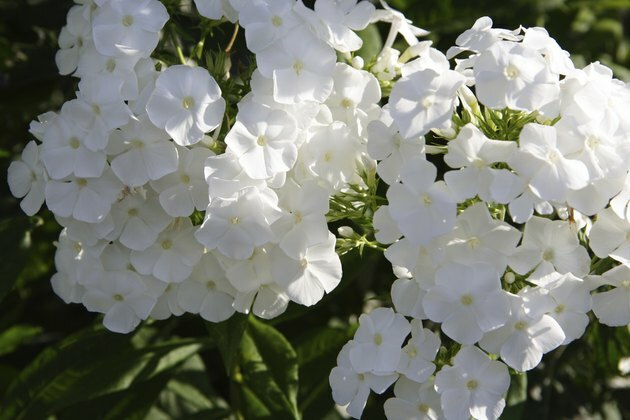 Annual night phlox reaches 12 to 18 inches in height and should be grown 12 to 15 inches apart in the garden. Grow night phlox in full to partial sun to keep the plant healthy. Night phlox flowers in mid- and late summer. What Kind of Flowers Only Open During a Full Moon?